It's almost Mother's Day! Have you sent out your Mother's Day greeting yet? Count your blessings if you have someone out there to celebrate. My own mom died when I was in my twenties, and even though it doesn't hurt like it once did, you never forget. You always miss your mom! I was lucky enough to have a wonderful stepmom and a loving mother-in-law who helped fill in for my mom, but there's just something about a mother that's irreplaceable! 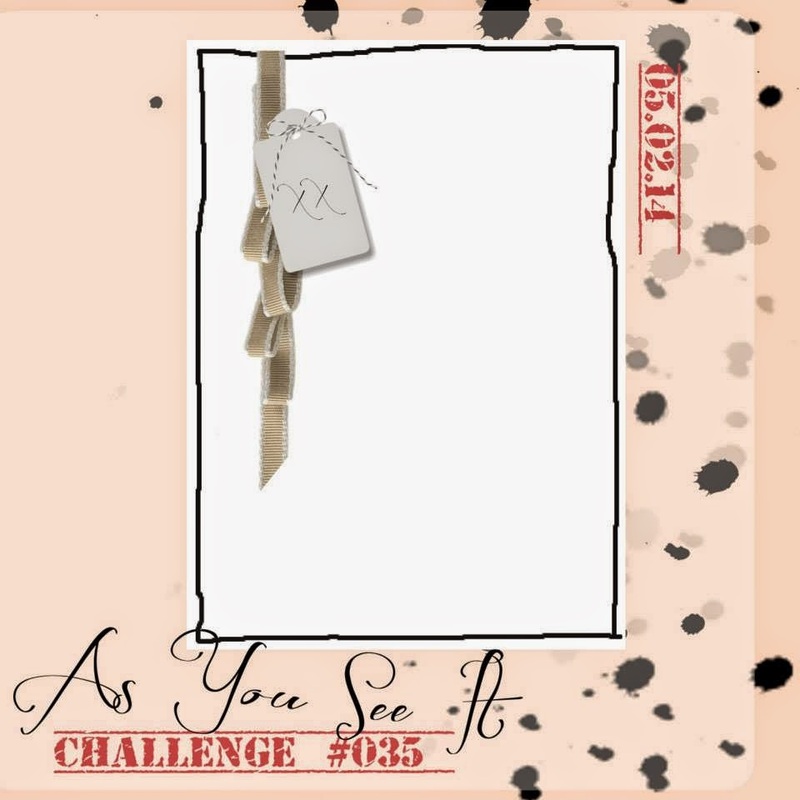 When I saw the As You See It Challenge #35 for today, I was a bit stumped by all the open space. What to do with it? I love the scrunched and dangly ribbon down the side with the little tag, but I couldn't just leave the rest plain. I am learning to embrace clean and simple, but that is just too much for me. 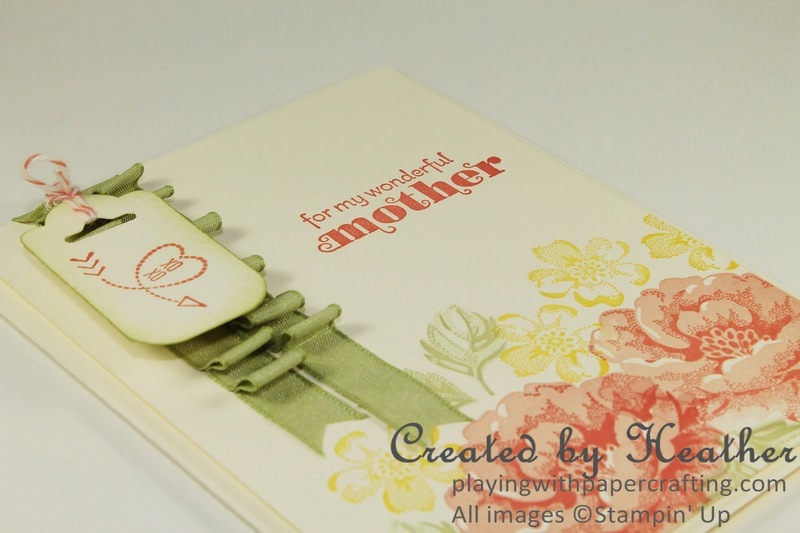 Then I thought about stamping my own Designer Series Paper, but that turned out to be not enough white space. 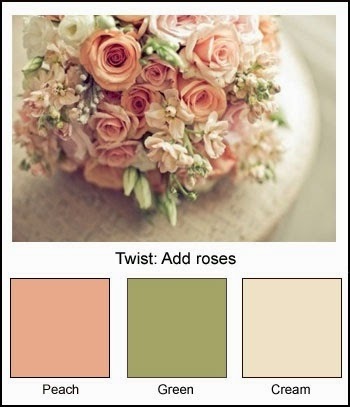 It was at that point that I found another colour palette from Pinterest. It is such a soft and beautiful combination, that it seemed designed just for mothers. If I used Crisp Cantaloupe and Pear Pizzazz with Very Vanilla, I decided, I could create a little bouquet down on the bottom right and still keep the integrity of the sketch. 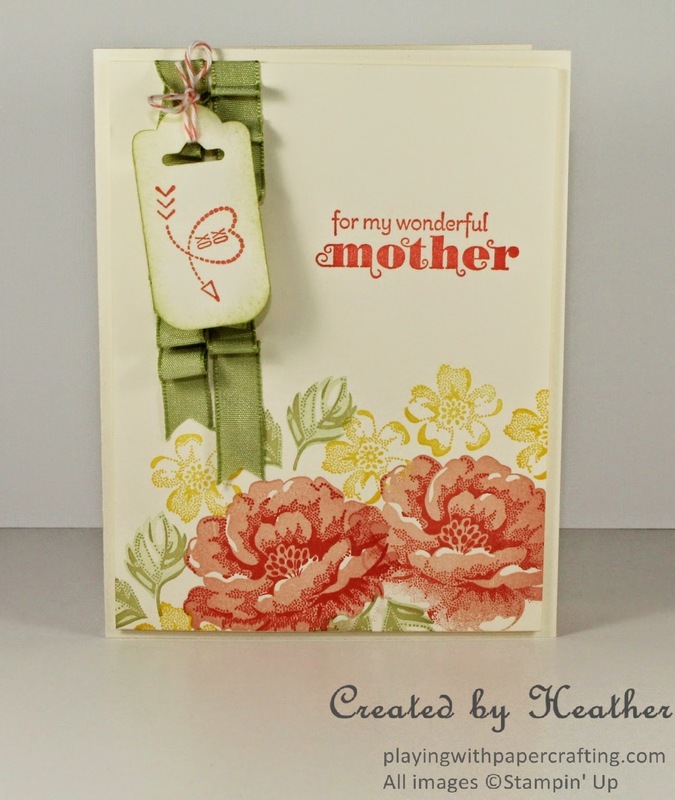 The sentiment is from the Delightful Dozen stamp set, which at last check, was still available in wood mount, even though the clear mount sets have been sold out. Delightful Dozen is one of the sets retiring this year which are only available while supplies last. There are some great sentiments in that set, so don't wait too long to purchase it. To make the rippled, pleated ribbon, I added some Sticky Strip in two side-by-side lines with a little over the top to the back of the panel to hold it in place. Starting at the top, I applied it slowly by hand, making little pleats as I went. Then I cut a flag in each of the ribbon ends. Some Calypso Coral Bakers' Twine helped to tie the tag onto the ribbon. 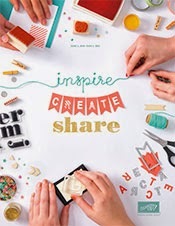 I am so excited by our new Annual Catalogue, which I got to see last night because I am a Stampin' Up! demonstrator! I honestly think it's our best ever catalogue! There's more pages, more products and some really creative thinking went into all the products we are offering this year. I guarantee that you'll be blown away! I stayed up probably most of the night making my wish list and pre-ordering from the products that are available for demos to preorder. It's the most intelligent and helpful layout ever, also in my opinion! As soon as my preorder comes I will start to create some samples to give you some idea. 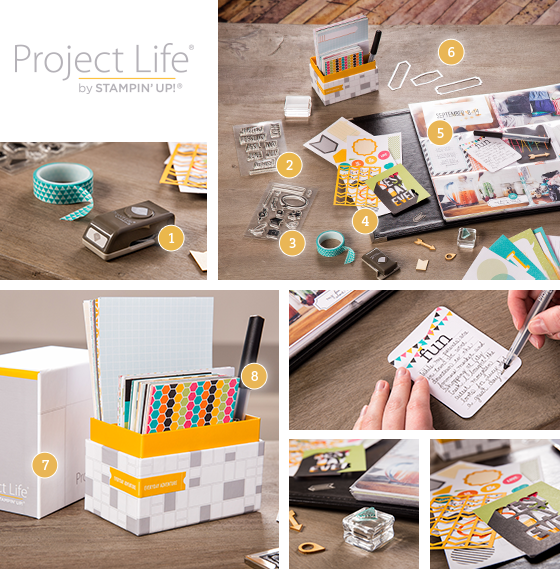 If you were a customer that ordered from me last year, I will have a catalogue shipped right to you from Stampin' Up. They will start to mail out mid-May. If you haven't ordered for awhile, but would like a catalogue, place an order with me in the next few days and I will see that you get one for free. You can still get in on this sneak peek and preorder! 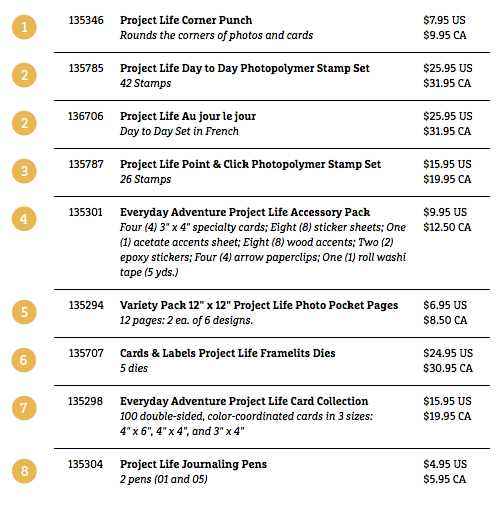 If you sign up for the low price of $125, you can include some of the preorder items, along with the new Blendabilities alcohol markers (which I'm eagerly anticipating) and the new Project Life products in your Starter Kit! Ask me how. Wow! So much to tell you! Exciting days ahead! 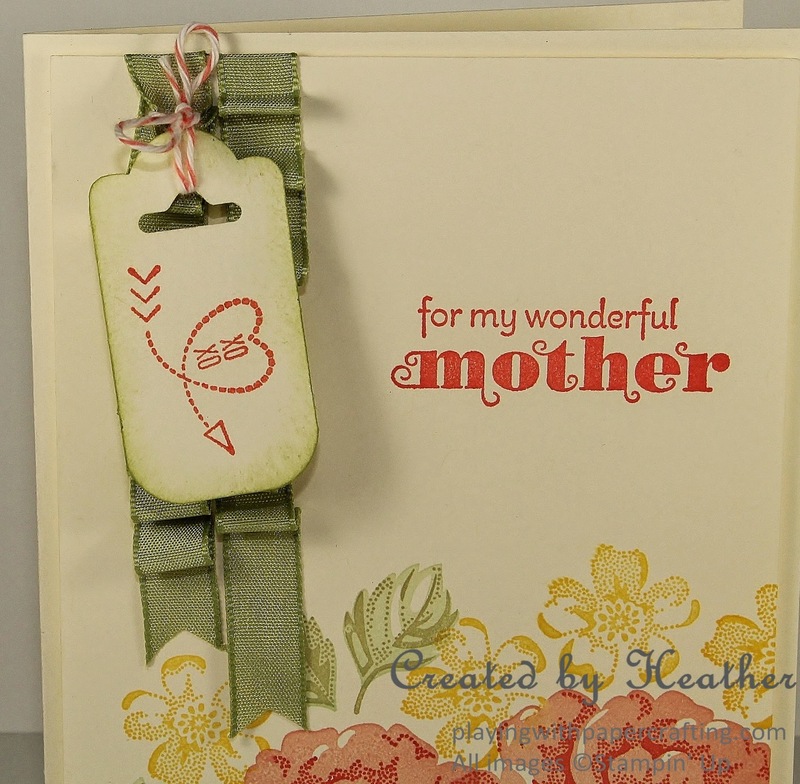 Very neat stamping, Heather. Fantastic Mother's day card. Thanks! All credit is due to the Stamp-a-ma-jig!